After barely squeezing into the playoffs in 2006-07 and being in contention for a return trip until late last season, things fell apart during the last 20 games of the season and the New York Islanders finished with the third-fewest points in the Eastern Conference. General Manager Garth Snow has decided to give his younger players a bigger bite of things this season. Snow dismissed coach Ted Nolan and replaced him with Scott Gordon, last season's American Hockey League Coach of the Year. The thought is Gordon will deal better with young players than Nolan, who continued to give key ice time to veterans late last season. Things also turned sour with goaltender Rick DiPietro, who strained his hip at the All-Star Game, missed time when his grandmother died, and then saw his season end in mid-March when he re-injured the hip and needed surgery. The team also lost four key defensemen to injuries for long stretches, as well as defensive-minded center Mike Sillinger. The Islanders might be hard-pressed to compete for a playoff spot this season, but their young players -- led by highly regarded forward Kyle Okposo -- will gain experience that only will help them going forward. When healthy, DiPietro is one of the top netminders in the League. But since March 2007, he's had surgery on both hips and his left knee, and he's missed time with a concussion. Before the All-Star break, he was 19-17-6 with a 2.59 goals-against average and two shutouts, earning him his first All-Star nod. DiPietro, though, never was the same after straining his hip in the skills contest, and he had season-ending surgery March 19. It's hoped Gordon, a former goalie, will reduce DiPietro's workload to keep him healthy. Last season, DiPietro played 63 of 73 games, including 33 of the first 35 before missing three with a knee injury, and 26 of 28 when he returned. Joey MacDonald, who won 16 games for Bridgeport, the Islanders' American Hockey League club, will compete with Yann Danis, a free agent signed away from the Montreal organization, for the backup spot. MacDonald likely has the edge since he is on a one-way contract. Injuries decimated this unit, as only Radek Martinek played more than 65 games. Snow has assembled a grizzled, physical group, but last season's unit lacked a skill player. So during the summer, late-blooming Mark Streit was signed away from Montreal to add some jump and quarterback the power play. Streit didn't arrive in the NHL until he was 28, but his numbers improved in the three seasons he spent with the Canadiens, topped by career-bests of 13 goals and 62 points, third among the League's defensemen. Chris Campoli should be healthy after missing the last 35 games of the season with a shoulder injury. Campoli was on pace to equal the 34 points he scored as a rookie when he got hurt, and if healthy, he should provide another offensive option from the blue line. Brendan Witt and Andy Sutton will provide solid, stay-at-home presences. Witt, 33, missed 21 games with knee and ankle injuries, but still had 135 hits and 133 blocked shots. Sutton, a towering 6-foot-6 and 245 pounds, finished second on the team with 86 penalty minutes despite not playing after Feb. 18 due to a torn hamstring. After years of signing veteran top-six forwards to short-term contracts and hoping for the best, Snow has decided to give his young players key roles. After fielding the lowest-scoring team in the League last season (2.30 goals per game), the hope is younger, hungrier players will at least give more bang for the buck. Okposo, the No. 7 pick of the 2006 Entry Draft, capped a whirlwind season with a nine-game NHL audition. After starting last season at the University of Minnesota, he left school after the World Junior Championship, had 28 points in 35 games in the AHL with Bridgeport, and then had two goals and five points in nine games with the Islanders. He'll likely start the season at right wing on the team's top line. 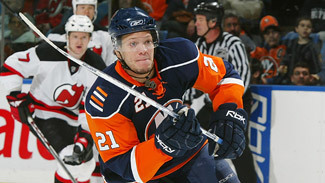 Okposo had his most success playing in the AHL with Jeff Tambellini and Frans Nielsen. Tambellini has been a scoring star at the Triple-A level, but so far it hasn't carried over to the NHL, where he has just four goals in 79 games with the Kings and Islanders. At 24, the Isles will give him every chance to have success. Nielsen, a third-round pick in 2002, had 38 points in 48 AHL games, but just three in 16 games with the Islanders. The one place the Islanders have a veteran presence is at center, so he'll have to work hard to earn any NHL ice time. Josh Bailey, the club's first pick in the 2008 draft, also will be in the mix for an NHL spot. Bailey had 96 points last season with the Ontario Hockey League's Windsor Spitfires, and Okposo raved about Bailey's play at the Islanders' prospect camp in July. With Miroslav Satan and Ruslan Fedotenko departing, the plan is to give their ice time to improving youngsters Sean Bergenheim and Blake Comeau. The 24-year-old Bergenheim returned from playing 2006-07 in Russia and Finland to total 10 goals and 22 points in 78 games, with six of the goals coming after the All-Star break. Comeau, 22, had eight goals and 15 points in 51 NHL games in just his third pro season. While most of the preseason buzz surrounds the team's youth movement, there is a significant veteran presence. Mike Comrie centered the top line and led the team with 49 points, but hopefully playing for a new contract and being surrounded by hungry kids will motivate him to a better season. Doug Weight had a disappointing season, scoring just 25 points in 67 games with St. Louis and Anaheim, but a reunion with friend and former teammate Bill Guerin could reinvigorate him. Guerin, the club's 37-year-old captain, scored a team-best 23 goals, and will provide a strong, steady voice in the locker room. With a young, impressionable roster, there are far worse players in the League for them to learn from than Guerin. The same can be said for Weight. * As long as Rick DiPietro stays healthy, the Islanders can remain competitive. DiPietro has the ability to win games by himself, and if new coach Scott Gordon doesn't overplay his netminder, DiPietro could steal some games. * Young, hungry kids bring lots of energy, and the Islanders will have a lot of them -- for this season and beyond. While 2008-09 might not be one to remember, this season could mark the beginning of a new day for the franchise. * Kyle Okposo will create excitement. At 6-1 and 200 pounds, Okposo has size to go with his tremendous skill. No matter where he played last season, he never looked overmatched, and that includes his late stint in the NHL. How he holds up over an 82-game season remains to be seen, but Okposo is the best young scorer the club has produced in a very long time.